A $10 materials fee will be added to the invoice when you register. In this class you will learn to build a storage box with a hinged lid out of sheet metal. Patterns in a variety of sizes will be available, including standard cigar box size. Every student will take home a useful box they have built. Details: there will be an overview of pattern development. We will transfer the pattern onto our sheet-metal. Cut it out with the shear and tin snips. 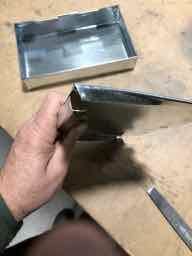 Then we will fold up the sheet-metal into our box and lid. In final assembly we will install hinge pins and close our hinges with spot welds. There is a materials fee of $10 for sheet metal included in the price of class.